I was never a fan of Whitney Houston. I did not dislike her; I just was not a fan. However, I took notice of her. We somehow seemed to be karmicly linked in an inverted pattern: when her life was getting better mine seemed to get worse and vice versa. In recent years, she seemed locked in a downward death spiral. In contrast, my life has been rising and improving on many levels. 2011 was a “banner year” for me; I was not quite surprised when I learned that she died today (technically yesterday, but I have not been to sleep yet). The entire thing felt very astrological, and I had not posted in a long time. I will not have a window to post again until March or April. So, here is my lone post until I can return. I note the following ideas which are well documented in the media: (1) she had a significant alcohol / drug problem; (2) she had repeatedly attempted recovery; and (3) we do not (yet) know the cause of death. I draw the following conclusions: (1) she really wanted to be clean & sober but seemed unable to maintain that condition and (2) we do not (yet) know her cause of death. What I am really saying is that, although some may infer drugs, she might have been perfectly clean. This last idea is not so far-fetched. I have a clear memory of the day that I heard that Waylon Jennings died. I heard it in the early morning, and I think that he died the night or afternoon before. We learned that he had been clean & sober for 10 years, but that diabetes had led to his death. I learned subsequently that this type of death is common among people in recovery: the booze & drugs causes so much damage that diabetes, liver failure, and similar disorders cause a death at an early age. That is a heartbreak. And, maybe that is what happened to Whitney. We’ll find out soon, and I’ll likely edit this post with updates. 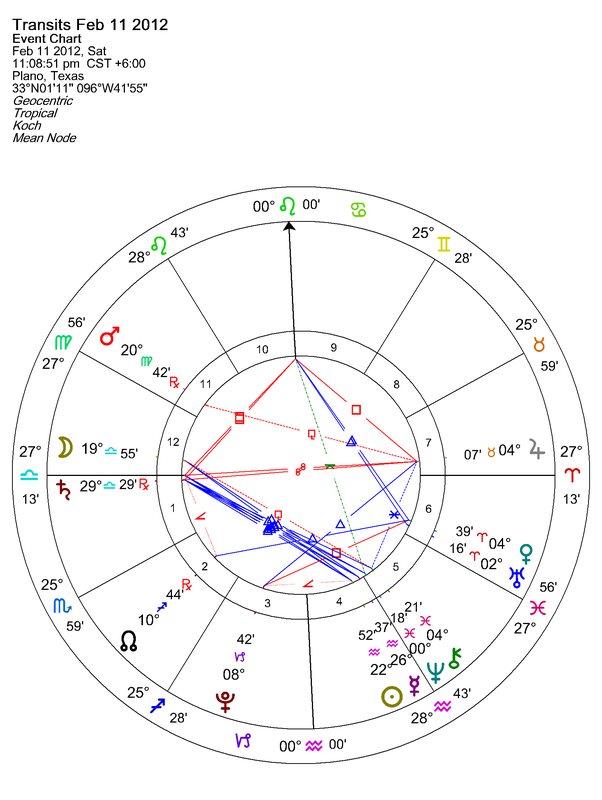 I cast a chart for the moment that I heard of her death. My consistent methodology is to allow the software determine this. That is, I operate on the idea that my idea or realization is not fully manifest until I open a chart of the current date and time. 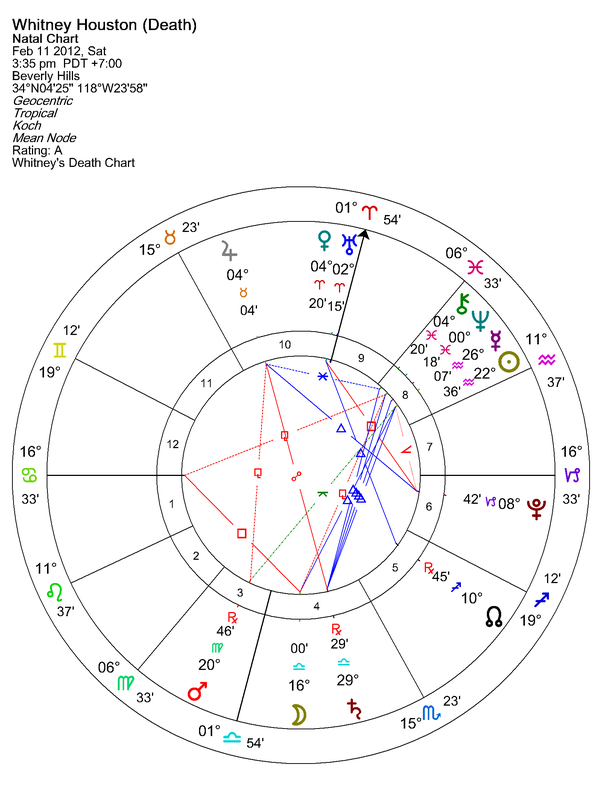 That list shows several things: (1) for her, the phrase “she is now at peace” is very true; if I heard that she “passed in her sleep” then I would not be surprised and (2) some kind of strong emotional issue either came to a head or had come to a head (Moon OPP Moon; transiting Mars square natal Pluto). I note that she had experienced her fourth Jupiter return. Much discussion has been made of people being carried away by Saturn, but Jupiter can do this as well. Arguably, the life lessons she taught and learned were Jovian in nature: she lived a larger than life personna as dramatized in “The Bodyguard.” That movie illustrated some of the pitfalls of being a “larger than life” personna. 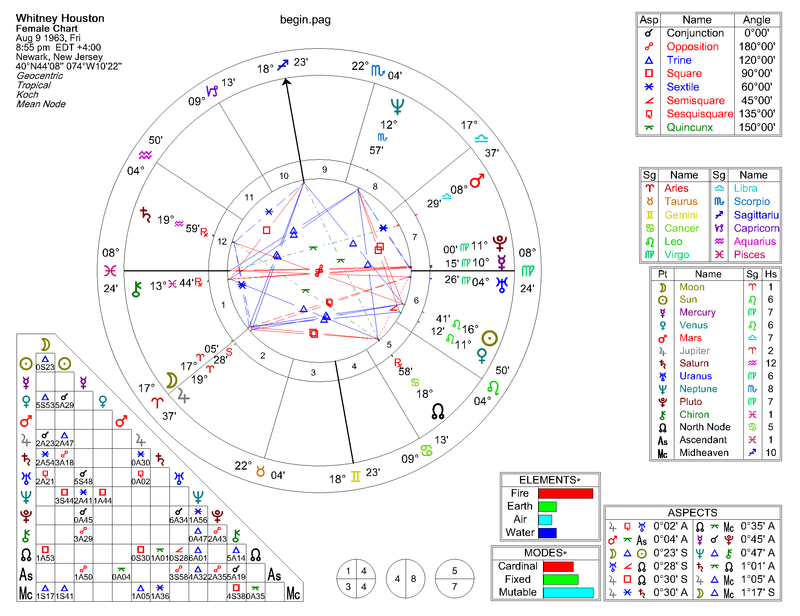 After her death, and at the time I received the news, transiting Moon opposed natal Jupiter. I know that a fair number of you want the actual death chart. She was pronounced at 3:55 PM PST, but reports say Paramedics found her unresponsive and performed CPR for 20 minutes. Actual time of death could have been earlier. Oddly, an argument could be made for a slightly later time of death (the culmination of opposition of transiting Moon to natal Moon). 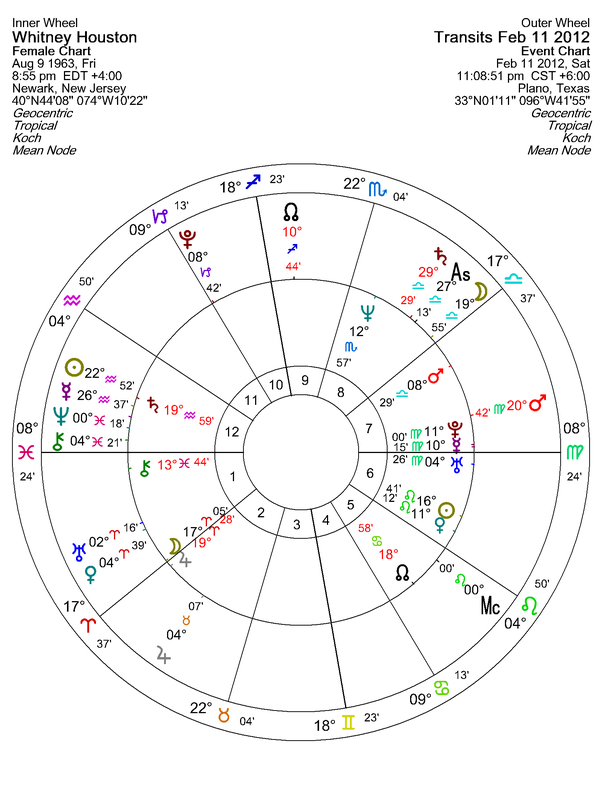 I note that the same four transiting planets that formed a stellium in her natal chart are in the 8th house (Death House) in this chart.